This EVOO is made from a special selection of olives collected from the olive grove Ricca, in the Colombiera locality in Poggi di Imperia, 60 meters above sea level, sheltered from the sea. 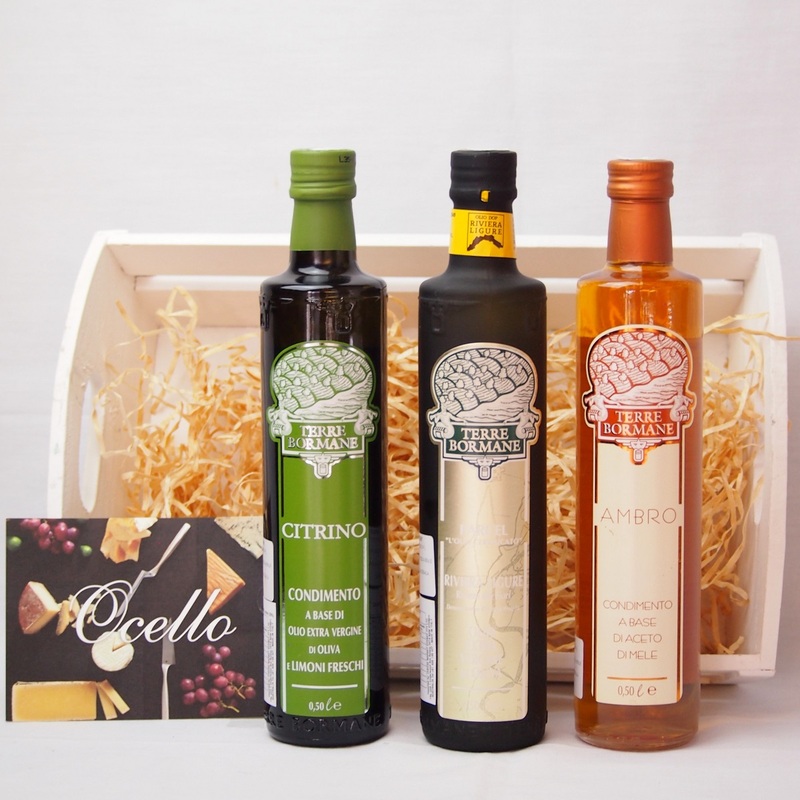 The oil is produced using 30% green olives, 50 % maturing and 20% black. The tones are primarily sweet, of pine nut, with an aroma of white fruit. An extra virgin olive oil made with olives farmed according to organic certification regulations. It has a wonderful golden colour with hints of green and a round, fruity flavour. Use in dressings, for dipping or to dress hot and cold dishes. 500ml bottle wrapped in green tissue paper. This oil from the Ligurian Riviera area has DOP status – which involves strict controls over the growing and production to safeguard quality. It has a delicate flavour with a very fruity flavour, round finish and green-golden colour. Great to use for dressings, dipping and cooking. 750ml bottle in decorative wrap or brown paper. From artisan producer Casa Olearia Taggiasca. Balsamic Vinegar from farmhouse producer Acetaia Reale in Modena, Italy. 'Serie 8' means it has been matured over time in a series of 8 wooden barrels (approximately 8 years), creating a a rich, sweet/savoury flavour. Ideal to serve with grilled fish and roasted meats, bresaola, aged cheeses, vanilla ice cream and fruit salads. 100ml bottle in box. Balsamic Vinegar from farmhouse producer Acetaia Reale in Modena, Italy. 'Serie 8' means it has been matured over time in a series of 8 wooden barrels (approximately 8 years), creating a a rich, sweet/savoury flavour. Ideal to serve with grilled fish and roasted meats, bresaola, aged cheeses, vanilla ice cream and fruit salads. 250ml bottle in box. Balsamic Vinegar from farmhouse producer Acetaia Reale in Modena, Italy. 'Serie 4' means it has been matured for approximately 4 years in a series of wooden barrels to create a balanced, tangy flavour. Use in dressings, vinaigrettes and marinades. 250ml bottle in box.